The entire nation, and perhaps the whole world, has been glued to their television sets watching the Kavanaugh confirmation fiasco being played out, reflecting the worst in those who are determined to uncover the “would-be worst” in a highly qualified and highly regarded — by those who know him — nominee for the highest court in the land. Unfortunately, what should never have been an issue to begin with has become a political circus, and they are still bringing in the clowns. While South Carolina could be very proud of Senator Lindsey Graham, Senator Jeff Flake (Arizona) gave his name a new twist as he gave up his support of the nominated justice for the Supreme Court after being verbally attacked by #MeToo activists on the elevator after making his support for Kavanaugh known. It may well be that in reality the Democrat opposition to Judge Kavanaugh is nothing more than an opposition to and an attack on President Donald Trump, rather than on Kavanaugh himself. As we have been saying for the last nineteen months, the Democrat attacks on President Trump are probably nothing more than a vindictive way to attack the president for forcing them to change their plans — which were destroying this great nation. Lucky enough for us, however, the President is not giving up, and every effort the Democrats make to destroy him only makes him stronger and proves him right once more. not old enough to take part in the political process. Up to now there was an honorable code of silence to keep the family and the minor children of political targets out of the fight and out of all the infamy, lies and attacks, but apparently that is no longer the case, as can be seen by the pointedly and unnecessary family-hurting behavior of the liberals in the Democratic-Socialist party. Never once was Chelsea Clinton’s name used in any of the attacks on her father or even her evil mother; in fact most people felt sorry for her when her father shamefully embarrassed the Democratic Party, the nation and his entire family by having an extramarital affair in a room right next to his wife and his under-aged daughter. Not once were the minor daughters of the Obama family mentioned during all the mistakes their father made during his eight years in the White House. It is sad to see that former President George Bush, due to his antagonistic feelings against President Trump, placed himself on the list of so-called friends of the Obama family, but has not used that relationship to help his friend and protégé, Judge Brett Kavanaugh, by asking his new friend to lower his guard and the attack on the nominee for the US Supreme Court justice — or at least to stop the attacks and insults to his family. Barack Obama is adored by Democrats; he may still have some of them listening to him; perhaps the attacks on the Kavanaugh family could be made a little less aggressive. 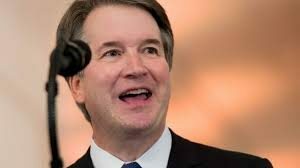 The FBI has investigated Brett Kavanaugh six consecutive times and has not found anything derogatory in his record; but now, on the seventh try, knowing that the Federal Bureau of Investigation has a feeling of ill will toward President Donald Trump, they may find something that could damage President Trump’s nominee for the highest court in the country. politics, betraying the Constitution and breaking the law themselves. It is our belief that the law enforcement agencies in this country only follow the law when it is convenient or beneficial to themselves; we believe that when they attacked the residence of one-time President Trump’s campaign adviser Paul Manafort in the middle of the night in the summer of last year while Manafort and his family were sleeping, they might have hoped that he’d have a firearm along with an intention to protect his family by using it; then they could have had an excuse to kill him — but of course that is only our belief. The American people have to learn and accept the fact that the Socialist Democrats of the United States Senate are not fighting so hard against Judge Brett Kavanaugh because he did what Dr. Ford claimed he did to her; they could care less about Dr. Ford; the Socialist Democrats of the United States Senate are fighting against Judge Brett Kavanaugh just to go against President Donald Trump’s nominee. All this sham of committees and the FBI investigation is just their way to keep fighting against the legitimate elected President of the United States of America.